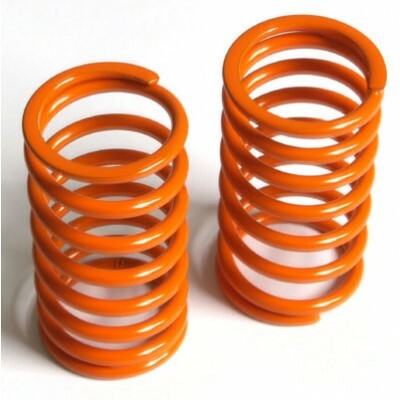 > dampers>damper spring>springs big-bore>Spring long (rear) Big Bore progressive, orange, medium, 2 pcs. Spring long (rear) Big Bore progressive, orange, medium, 2 pcs. The new springs are much harder than the previous barrel springs. For tracks with good or very good grip conditions, this setup variant has proved very successful. More direct and precise steering and the car remains agile. The damper setup should be adapted to the springs. The original damper piston plates (8 x 1.5mm) can be drilled or you can buy it with the right holes (no. 1502818-26). For the new springs, new spring collars are required (no. 1512760).